​Czech glass, more famously known as Bohemian glass – Bohemia, being the historical term for the Czech Lands, now the Czech Republic - has a century-long history of being internationally recognized for its high quality, craftsmanship, beauty and innovative design. Because Bohemian glass is composed of the potash-lime from its forests – distinguishing it from the glassworks done in Murano, Venice - it is known for its durability and strength. Wherein lies man’s fascination with glass? Glass has been described as a medium of contradictions – “sturdy yet fragile, transparent yet luminous, inflexible yet fluid.” All these characteristics are made manifest in the process of glass-blowing, which Pačinek, in a first-ever, three-day lecture demonstration at the Museo Orlina, will share with a Philippine audience, to whom glass, continues to remain a mysterious and magical material. Beyond its familiar functionality, glass is a versatile medium for artistry and the creative imagination, indeed the exemplary material, in its unique, light-releasing ability, for the evocation of the human spirit. Glass-blowing was discovered by the Romans in the early to mid-first century BC, and just like prehistoric man’s discovery of fire which forever transformed his life, glass-blowing transformed glassmaking, and allowed it to flourish. Appropriately, it is fire, at its highest temperature, that transforms a mass of molten glass into astounding sculptural vessels of utility and beauty. In his lecture-demonstration, Jiří Pačinek may make it seem as easy and as fun as blowing into a plastic balloon, but you will be blown-away by his astonishing craftsmanship and decorative artistry, producing artworks that are themselves, fresh from the furnace, marvelous, swirling gems of vibrant color and intricate form. True to its mission of stoking the fire of interest in glass sculptures, Museo Orlina introduces to the Philippine public the breath-taking glass artistry of Czech artist Jiří Pačinek. Czech artist Jiří Pačinek began his training as a glass apprentice when he was only 15 years old in the glass-making region of Nový Bor. In 1990, he started working at the famous Chřibská glassworks, focusing on freehand-shaped glass. 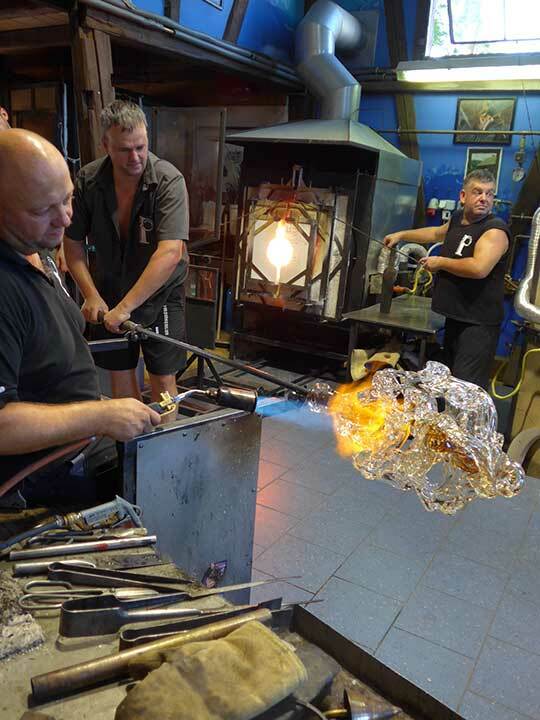 In 2008, Pačinek set up his own glass studio and gallery in the glassmaking town of Lindava. He creates and showcases his own works: demanding sculptures of human and animal forms, and large sculptural bowls in limited editions. ​Pačinek travels around the world to teach his glass art techniques. This is his first visit to the Philippines.